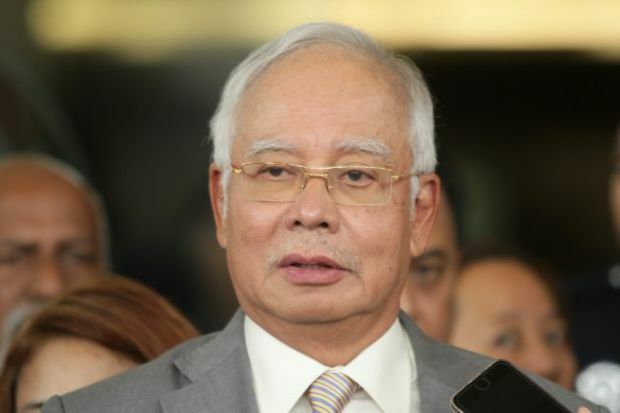 KUALA LUMPUR, Feb 8 2019 : Former prime minister Datuk Seri Najib Razak was charged again in the Sessions Court here today with three counts of money laundering involving RM47 million five years ago. He was charged with committing the offences again less than 24 hours after the High Court here gave him a discharge, but not amounting to an acquittal, on the three charges of money laundering yesterday. Najib, 66, pleaded not guilty to all the charges which were read out separately before judge Azman Ahmad. On all the three charges, Najib, who is Pekan Member of Parliament, was alleged to have been involved in money laundering by accepting a total of RM47 million which were proceeds from illegal activities his three AmPrivate Banking accounts. The offences were allegedly committed at AmIslamic Bank Berhad, Ambank Group Building, No. 55, Jalan Raja Chulan on July 8, 2014 under Section 4 (1) (a) of the 2001 Anti-Money Laundering and Anti-Terrorism Financing Act 2001. He faced a maximum fine of RM5 million or imprisonment for up to five years or both, if found guilty. The prosecution, conducted by deputy public prosecutor Manoj Kurup, proposed for Najib to be released on personal bond without bail. “The prosecution proceeding last Jan 28 did not impose bail because it involved additional charges to existing charges at the high Court , but the charges today have yet to be brought to the High Court. “We take into account that the accused is facing many charges and on bail of about RM6 million and (his) passport impounded by the court. Hence, we agree to propose personal bond on the accused for this case,” he added. Lawyer Tan Sri Muhammad Shafee Abdullah, representing Najib, thanked the prosecution for suggesting the personal bond. Following which, Najib was granted personal bond on all three charges by the court. Earlier, Muhammad Shafee informed the court that the three charges made against Najib today were similar to the charges made against him at the High Court last Jan 28 and yesterday, the court granted his client a discharge not amounting to an acquittal on the charges following an application by the prosecution. The prosecution’s application was made on grounds that the money laundering case, which originated from the Sessions Court, should have been mentioned before the Sessions Court before they were transferred to the High Court. “These charges were substantively the same charges the prosecution bulldozed over to the High Court (on Jan 28) and yesterday, the Attorney-General said he withdrew the charges as there was a fundamental error bringing the case to the High Court before going to the lower court,” Muhammad Shafee said. Muhammad Shafee said the defence would submit objections against the three charges as there were several significant flaws in the charges. To the AG, Najib's appeal on withdrawal cert is "much ado about nothing"